July 24, 2018. 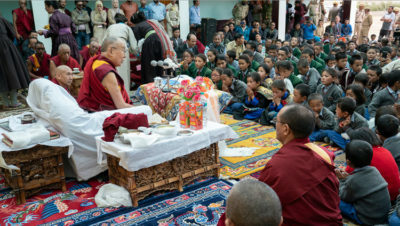 Padum, Zanskar, J&K, India – Among several groups of people waiting to see His Holiness the Dalai Lama as he left his residence this morning, he took time to talk to former students of the Tibetan Children’s Village School. He reminded them that despite fruitful relations with China, Tibet’s Religious Kings had chosen Indian sources as the basis on which to develop Tibetan language and literature. Similarly, they had invited teachers from India to establish Buddhism in Tibet. Consequently, the Land of Snow is where the Nalanda Tradition, an approach to the Buddha’s teachings founded on reason and logic, has been kept alive. He urged them to remember the value of the Tibetan language as the most accurate medium for expressing Buddhist ideas and the crucial role of reason and logic in their study. His Holiness drove to the Model Public School in Padum at the invitation of the Anjumane Moen-ul-Islam. Their spokesman told His Holiness how happy they were to welcome him as the embodiment of peace, communal harmony and fellowship. “I am also very happy to be here once again, able to share some time with my Muslim brothers and sisters,” His Holiness responded. “Wherever I go, I talk about the oneness of humanity—how as human beings we are all physically, mentally and emotionally the same. Everyone wants to live a happy life and no one wants to suffer. However, the crucial question is how to achieve happiness and reduce suffering? “It doesn’t come from outside, from wealth and fame. People who think of finding lasting happiness on the basis of sensory experience, relying on beautiful things they see or hear, delicious flavours and fragrances, or things that are delightful to touch, may be disappointed. Even if all the sensory pleasures you can think of are available to you, they won’t make you happy if your mind is upset and disturbed. Do you see this among people you know? Isn’t it true that there are people who seem to have everything they want, and yet they continue to be worried, stressed and upset? On the other hand, we all know of families who are not especially well-off, but are happy because they have good hearts and are loving and affectionate towards each other. “There was a Catholic monk I met who spent five years living as a hermit in the mountains above his monastery living on meagre food and facilities—hardly any sensory pleasure at all. I asked him about his practice and when he told me he had been meditating on love, the sparkle in his eyes showed that he had found true happiness. “I’m an old man now and I’ve faced difficulties since I was sixteen, but I’ve found making the effort to generate peace of mind has been very helpful. 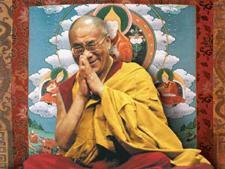 His Holiness mentioned that scientists are finding evidence that suggests basic human nature is compassionate. He said that this is the common experience of everyone who has enjoyed their mother’s love and affection from the moment they were born. Scientists have also found that while constant anger and hatred undermine our immune system, cultivating compassion increases our physical and mental well-being. Alluding to the fact that all the world’s major religions flourish in India, those that are indigenous and those from elsewhere, His Holiness declared that it is part of the greatness of India that these traditions live together in harmony. It is an example to the rest of the world. “There has been some discord between Buddhists and Muslims in Ladakh and even here in Zanskar. Yet all our religions convey the same message; encouraging love, compassion and contentment. Therefore, we should be able to live together in friendship and harmony. This will contribute to greater progress and development in the community. Think of yourselves just as Zanskaris. The recent meeting between Muslim and Buddhist representatives and their resolution to settle differences between them has been reported to me and I greatly appreciate it. His Holiness’s next stop was the new medical facility known as the Men-Tsee-Khang. Ven. Chosphel Zotpa told a packed crowd that the institution providing access to both traditional Tibetan and allopathic treatment had come about due to His Holiness’s kindness. He thanked him and requested him not only to return to Zanskar again and again, but also to grant the Kalachakra Empowerment once more. “Since it was difficult to get proper health care in such a remote place, we discussed setting up facilities to provide Sowa Rigpa and conventional allopathic treatment,” His Holiness replied. “I’m very glad to know that it is proving helpful. I’d like to thank the medical staff in particular for all your good work. “I am a follower of the Nalanda Tradition, trained in reason and logic, which has enabled me to see things clearly on my occasional visits here. I don’t have much to say, but I can see that you have understood and followed my advice. I have encouraged deeper study of Buddhist teachings in the monasteries and nunneries and now even lay-people are showing increased interest too. “The philosophical and psychological ideas we find in the Buddhist scriptures don’t need to be viewed only in a religious light. They can also be studied in an objective academic way. This is why I have recommended that instead of religious teachers in the Tibetan schools set up at the time of Pandit Nehru, we should now appoint Philosophy Instructors. In addition to the advice about love and compassion that is common to all religions, Buddhism explains about selflessness. And it’s something everyone can learn about. “At the Muslim school just now I talked about the need to care for the environment. I mentioned that in Dharamsala where I live there is much less snowfall than there used to be. Perhaps it’s the same here. We need to prepare reservoirs to ensure the water supply. In ten years things may be much worse and in Ladakh and Zanskar. You may face serious difficulties in relation to water. There’s a need to plant trees and implement water harvesting. “When I visited Israel I observed how in the Israeli settlements they have methods for using water drop by drop to maximum effect so their surroundings are green. The Palestinian areas, meanwhile, were like arid desert. Perhaps Israeli expertise could be helpful here. “Climate change means we cannot go on living the way we have for the last 1000 years. The weather is hotter than ever, but at the same time we face floods due to excessive rain. Natural disasters are on the increase and it seems climate change and global warming are likely to get worse. At the Lamdon Model School in another corner of Padum, Geshe Damchö, the school Chairman, gave a short introduction. He mentioned that the school was founded in 1988 and that since then 870 students had graduated. Of these, eight had gone on to MB.BS medical training, seven pursued PhDs in different subjects and many more had entered IITs (Indian Institutes of Technology). He requested His Holiness to speak to the students and staff. “The people of the Himalayan Region generally follow the same culture as we Tibetans,” His Holiness began. “But you are free to preserve your culture and religion. We Tibetans have lost our country and face all sorts of difficulties, but things will change. Some months ago a Tibetan Muslim from Srinagar came to see me. Speaking perfect Lhasa dialect he asked, ‘Rinpoche, when will we be going back to Lhasa?’ He, like us, has not forgotten our homeland. “As I was saying, the Himalayan peoples follow the Buddhist traditions of Tibet, the Nalanda Tradition. I’ve heard suggestions that the Kangyur and Tengyur be translated into the Sikkimese and Ladakhi dialects, but it would be much easier for people to learn or improve their understanding of Tibetan. If you neglect your understanding of the language, it will be difficult for you to understand and explain what the scriptures say. As the saying goes, ‘If you have a jewel in your hand but fail to recognise its value, there’s no point in complaining once you lose it.’ Recently, the Tawang Foundation has announced plans to expand temples and monasteries across the Himalayas as centres of learning, which is an excellent development. His Holiness asked if the students knew the ‘Praise to Manjushri’ and hearing that they did suggested they recite it with him. He asked them to visualize Manjushri on the crown of his head and to imagine rays of light flowing from him to increase their wisdom and intelligence. He then led them in reciting Manjushri’s mantra Om arapatsanadhi. There followed a moving recitation of the ‘Prayer of the Words of Truth’, with even the smallest children singing the words fervently to the stirring tune. Towards the end the prayer expresses a wish: ‘May all the vast prayers of aspiration the lord Avalokiteshvara made for Tibet in the presence of the Buddhas and their bodhisattva heirs, swiftly come to positive fruition here and now.’ His Holiness remarked that there are many Chinese able to distinguish right from wrong who could find a way to settle the problem of Tibet. However, out of ignorance there are those who think it must be solved by force. This is an aspect of totalitarian thinking that has to change. “Tibetan religion and culture have the potential to be of benefit to the Chinese people. In terms of material development, China can help Tibet. This is the basis for our not seeking separation, but a solution for mutual benefit. “In this connection I really admire the European Union, which was set up after the Second World War. As a result, peace has prevailed for 70 years between former enemies. After the war, President de Gaulle and Chancellor Adenauer used common sense. They understood that pursuit of a common interest was better than a narrow focus on national sovereignty. The EU they brought about is a wonderful achievement. “In the 7th, 8th and 9th centuries, Chinese history books record, China, Mongolia and Tibet were three sovereign nations. Chinese records from the T’ang to the Manchu dynasty make no mention whatsoever of Tibet’s being a part of China. Since 1974, we’ve chosen not to seek separation from China. However, the rights we are accorded by the Chinese constitution must be fulfilled. Right now, China is changing and our door is open. His Holiness then drove back to the Phodrang for lunch. Tomorrow, he is planning to leave Zanskar and travel to Kargil.